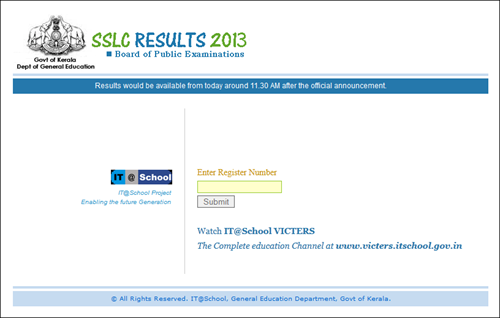 Kerala state board 10th (SSLC) exam school wise results will be available on official websites. With the Kerala SSLC results to be announced on 24th April at 11.30 AM is would be better to know the websites which publish the school wise results. This year 4, 79,650 students who had appeared for the exam. Other than knowing the results online students can use the SMS facility. Students who had appeared for the SSLC exam can check the results from the official websites which have been solely prepared to provide the complete information with school wise results. Check the following websites which would be activated after the official announcement of the results. The results can also be attained through SMS, facility initiated by the Kerala IT Mission. Through this m-Governance facility, students who had appeared for the exam can get their results by sending an SMS. For receiving results via SMS, the user has to send an SMS to Kerala short code No 537252 in the format, SSLC (space) registration number. If you wish to get the complete information with details about each student who had appeared for Kerala SSLC exam 2013, the knowledge of the school code is required to access the results. As soon as you enter the school code, the details about each student with grade will be shown in the webpage. You can get access to the School Codes from the link provided here. After the official announcement of the results, students can use the available facilities to check the results. It is advisable to take a print out of the page with details about the concerned student.